What would happen if you smooshed together many of the best parts of Rank Checker, SEO for Firefox, the best keyword research tools across the web, a feed reader (pre-populated with many SEO feeds), a ton of competitive research tools, the ability to compare up to 5 competing sites against each other, easy data export, and boatloads of other features into 1 handy Firefox extension? Well, you would have the SEO Toolbar. I watched the video and was impressed with that, it has so many functions all rolled into one is something that is needed. The keyword tool will save me bags of time. Cheers for this Aaron, you've outdone yourself again! Installed the toolbar. (FF3, Ubuntu). Can see the plugin as enabled via plugins browser. Don't see the actual toolbar anywhere (and is not listed in View/Toolbars list). If I try to open preferences via plugins list, it opens an empty window. Just thought you should know. Can see the plugin as enabled via plugins browser. Don't see the actual toolbar anywhere (and is not listed in View/Toolbars list). If I try to open preferences via plugins list, it opens an empty window. Just thought you should know. Hope You'll be able to fix it soon, I'm looking forward to use it for my everyday work. I have to admit that lately I prefered SEO Quake to seo4FF, but this seems to go way beyond that! I accidentally launched the 0.1 version when I should have launched 1.0.1 ... can you try to download the new version and let me know if it works for you? I am using Firefox and site info is not able to export data. Is there something that I am missing? Can we have a button we can use to turn display of the toolbar on or off similar to the Web Developers toolbar? Great toolbar Aaron - one thing, my collegues and I found we had to "restore default set" (even though we hadn't changed anything) in the customise screen to shrink the toolbar to a sensible size. Otherwise when installed the size of the toolbar was so large we couldn't see all the functions (and missed the best bit - the compare function at the end! This a great tool but a lot of people are going to wreak havoc with the toolbar, given the amount of polling it does out of the box. I am almost concerned that this tool alone will make some of the data providers find ways of switching off their API. I think you should make only a small subsection of the data available by default. To get extra data, the user would have to click a button on the toolbar. That way the user is only getting all the data when s/he needs it. Almost all the data that pulls in by default is via API. I have pretty good relationships with most of the data sources. The I button on the toolbar does allow people to grab more data. Thanks for the feedback Howard. We will look into fixing this. BTW, I like your idea of asking for donations for your free SEO tools to be donated to certain charities. Enough to include it for one of our own services (Typepad to Wordpress migration). I would suggest that while this tool is hot and new you put the same donation box for charity you havehad over at SEO for Firefox out. I went over there now to to donate $25 - alas the lockbox was gone. If you don't want the trouble of taking care of it yourself, you could set up a special donation page with a really worthwhile charity (it should not be country specific - think Médecins sans Frontières aka Doctors without Borders - I hope the duplicate content penalty isn't hitting MSF too hard - or perhaps a wildlife fund) where the recipient organisation would keep track of the donations for you. Heck, I'll make it even easier. Thanks Aaron, for the super tool(s). I've donated $25 to Médecins sans Frontières on your behalf right now. There are still some things we can improve with this tool. Once we start making updates the update page will have something on it. I feel like I am staring a gift horse in the mouth when I say anything about this tool except WOW and THANKS, but I will echo MattWhelan and say that it is has so much packed into it that it becomes hard to see it all until I expand my window to over 200 pixels wide. It also seems to be marginally taller than my (now) second favorite toolbar, the web developer toolbar. Originally the toolbar was not showing fully on my browser. The trick to fixing this like someone else above mentioned is to click "Restore Default Set" in the toolbar options menu. After that it fits everything perfectly. Thanks for the tool Mr. SEO, look forward to seeing what types of things you will offer in paid versions. "The trick to fixing this like someone else above mentioned is to click "Restore Default Set" in the toolbar options menu. After that it fits everything perfectly." I'm having the same problem, sorry but where do I find the "Restore Default set" button? How do I get to the toolbar option menu? Thanks Aaron, lots of great competitive information. as far as the restore default settings goes, you have to right click near the top of the browser (above address bar and toolbars) and that gives you a link to "customize" from there you can "restore defaults"
Thanks Aaron, I did it and worked partially. I can see all the buttons now but some of them don't work like the seo rss button. The "Restore Default Set" definitely helps but does not solve the problem completely. At least for firefox 3.0.5. I followed the suggestion way up above and did click "Restore Default Set" which seemed to work. At a glance for this page the tool bar showed the "More" drop down all the way to the right. However, on our site I noticed the RSS button was all the way to the right. On a few other sites that had very little data the RSS, Highlight Nofollows and Compare buttons are also visible. Basically the less data there is, the more buttons on the tool bar are visible. I thought these missing buttons would be in the "more" drop down but they are not. Has anyone else noticed this? Found a way around this? I'm using firefox 3.0.5 on a 1024 x 768 monitor at my work desk. I had to talk to MSF to get my donation to go through as I hit a credit card snag (out of country use of card). Apparently both Canadian MSF does have a managed gifts program as does American MSF. Andrea at MSF.ca told me that the Canadian version was just put in place before Christmas. The NGO's are getting more sophisticated online. Good to see. Counterpoint: The link is to the American version. It looks like the organiser fees including credit card 7.5% so even donation websites are a toll business these days. The above is a bit off topic but more useful to you so if you'd rather file this away somewhere, I won't take it personally. Thanks for yet another great contribution! One question regarding privacy: is there any statement about the use of information that could potentially be gathered from the use of this tool by SEO Book or its affiliates? Almost all the data points are pulled in from APIs from the respective companies (with a few data points being scraped). Some other well known SEOs have a huge EULA where they inform you that they may spy on you and so on, but this toolbar does not spy on users and does not send any info back to SEO Book (unless of course you chose to use our keyword tools and seo tools on our site ... where you are directly interacting with our website). We do not nave a phone home feature (unlike other SEO firms). this tool is really nice! Yeah you shouldn't be checking the google directory for dmoz because the google directory doesn't reflect dmoz exactly. for example my site isn't showing up in the google directory (chrishornak.com) but if you search it in dmoz it shows up. So I'd suggest changing that. I'm torn between this seo toolbar and the seoquake toolbar. There are a few features that seoquake does better like; xml sitemap check, robots.txt check and the external links analysis. We search for pages listed in the Google Directory (a DMOZ clone) that have your URL in the text. It is sorta a higher order search to see how connected your site is in with other trusted sites, even if you do not have a direct DMOZ listing for your website. Awesome work! I've tried a handful of other "SEO Toolbars", but this one covers just about everything that I want. Nice work. Oh, and thank you to those who gave the "restore defaults" tip. I have a 24" apple cinema display and the toolbar was too wide for it...that trick snapped everything back in. first try : very impressive ! What a great tool ! Very powerfull and usefull ! Even for a "0.1" release ! toolbar now visible yay! however, info pagerank, etc covers up the seo toolbar logo so i can't click on it to configure options. in other words, instead of the little i within the blue circle icon being to the right of the seo toolbar logo, it is on top of it (as is the pagerank dropdown). Amazing plugin. I can now dump every other plugin I'm running. I'd prefer the Y default backlinks for site & domain to come from site explorer, and only use the old way of searching for links when looking for specific extensions. One request. With the 'Keyword Suggest' feature, is it possible to modify the site sources for local results? For example, since most of my clients are in Australia, I use the Google Adwords Research Tool for Australia a lot- is it possible to have an option so that we can select a particular keyword research tool market such as Australia for all or some of the sites you use as sources? that would be an interesting sounding feature. how many would you like to see regional data for? some of the google tools? any others? Wow! That is so cool! Thank you! A workaround could be to use an alternative profile in FF and use the toolbar from there but it's a bit fiddly. For anyone who's interested an easy way to set up and manage alternate profiles is to use the FF Profile Manager (although it's still 'experimental') - https://addons.mozilla.org/en-US/firefox/addon/9452. I look forward to the update! That's a great tool! I'm a fan of Rank Checker and SEO for Firefox, and now it is an integration together with lots of wonderful add-on features. Thank you for your awesome work. Been playing around with the tool this morning, and loving the integration of so many helpful queries. This is truly an awesome tool, and one that I keep on recommending to other SEOers. **There's a typo under the blue information icon where it says "Site PR" as opposed to "PR" or "PageRank". **Is there any way of changing the rank checker to include UK results? Congratulations on producing yet another awesome SEO tool! Gotcha on the site PR...that should just say PR. will get that fixed. If you install the rank checker extension as a stand alone extension it lets you use international versions of Google. you can even use UK and US at the same time for Google. This is a great release - congratulations on a awesome tool and successful launch. You are clearly a leader in the industry and you back it in 2009 with yet another unbelievable tool for free. The forums are popping with great reviews of this toolbar. Keep up the great work and thanks for giving back to the community. Thanks so much for this it simply rocks! As others have mentioned, WOW what a great tool thanks! I think this will replace SEOQUAKE for me. One of the only things that i would like extra at this moment in time would be a button indicating if the site has a robots.txt file then a link to check it if it does. Would it make more sense for us to put that in as a feature inside seo xray, or would you like that to be a list item in the competition dropdown? The only thing that would be great to add is a feature like "Nichewatch.com" with allinanchor, allintext, and allintitle (and the ability to run those commands for different country versions of Google). Some internationalization features would likely add value for a lot of users. We just wanted to ship out a great tool and get some feedback before we got lost in complexity...this is part of the reason search engine services, international search engines, and perhaps proxies are not yet baked into the toolbar. There might even be enough complexity in that subset of ideas for it to be its own tool rather than part of the toolbar. How about an edit option for keywords added ? If there is spelling mistake, i have to remove and again add the keyword. Also a promt while keyword deleting, even accidentally clicking the "cross" removes my keyword. Is it possible to integrate my SEO button to your toolbar? My site w3optimizer.com offers seo toolbar button for Google Toolbar. Is it possible to integrate custom buttons to your toolbar? if yes, I will write one and promote it in my site. We offer a bunch of SEO toolbar buttons as well. If you install the Google toolbar, then yes you can drag and drop buttons from one toolbar to the next. The reason our tools are better than most paid SEO tools is that those people typically create watered down low value tools to sell to ignorant newbies, whereas I try to create tools that I would want to use. I can't tell you how much I love using these tools. Quick suggestion and I don't know if it is possible/quick. Under the SERP where the other SEO information is listed, is it possible to get an "Add to the Compare List" button? I thought the initial experience of copying and pasting sites was a bit cumbersome at times. Thanks so much for your wonderful content and tools. For now we are going to have those fields be manually entered. If a person wants to compare a bunch of related sites that rank for the same keyword then SEO for Firefox automates that, and is easy to export. You have a few bugs in your pagerank calculator. Does this really have a pagerank of PR6?????? would show the PR for the home page rather than the uri actually displayed. After checking, I notice that the official google toolbar suffers the same issue: A url without a proper page name that just starts with a string of variables displays the home page PR. Thank you for the toolbar, it is extremely useful. I can't figure out what I did that would have caused this. I have uninstalled and reinstalled the toolbar, searched through the settings for anything that might work and uninstalled other Firefox Addons that may be conflicting. Great job again Aaron for this set of tools! I just installed you toolbar and its really awesome! I have a quick suggestion after using the Compare Site tool. Something like a "preset" thing like you have in Rank checker would be a great addition in this tool. The Web Developer Toolbar for Firefox has a button you can add to the toolbar that will hide/show the full Web Developer Toolbar. This is a cool feature as it keeps my browser clean of the toolbar when I don't need it. Adding a button that could do this would save me a few extra minutes each day. It would also be cool if the button not only show/hide the toolbar but if it enabled/disabled it as well. This would save me a lot of time. I suspect I lose about 10 seconds everytime I want to show/enable or hide/disable the toolbar. I may do this 10 or more times a day. Love the toolbar but it just stopped working over the past few days. I am on Firefox 3.0.5 and all I see is the SEOBOOK logo and then 7 thin lines. All the buttons and data have disappeared on the toolbar line next to the logo. I have uninstalled the toolbar, restarted Firefox, re-installed the toolbar and same issue. I tried your suggestion above and it worked perfectly which was right click on the toolbar, click on customize, and then click on restore to default and then all the buttons showed up. Thanks!!! Thank you, your suggestion to restore defaults worked. Also, thank you for such a great tool. This is a great plugin and you totally nailed it. Great job, kudos! I am unaware of that being from us...have you tried it on another computer? do you have other extensions installed? Ok, I deactivated the SEO Toolbar and the parameter was still there. Should have done that first. Haven't tried on another computer, but in all other major browsers, and this is only in FF. Thanks again, and I hope you know that I didn't automatically assume that this was the toolbar. I thought it was worth a shot asking you first, since it would have been possible that you knew something about it. Aaron, as always thanks a lot for providing the SEO Toolbar and your great SEO advice. I was doing some searches in Google, and going to the competition menu to select: "Show PPC Destination URLs". The only problem is that when you try and click on these PPC destination URLs, the unicode (%3F, %3D, etc.) characters are not converted over to (?, =, &, etc.) so the URLs don't load properly. I really like this feature as it lets you quickly open multiple PPC URLs and do some quick analysis without charging the advertiser. Maybe it's just something wrong on my end, but if not thanks for taking a look into this. 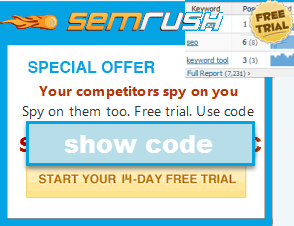 Suddenly this morning FireFox 3.0.6 is randomly asking me for my SEMRush.com username and password. ??? are you visiting SEM Rush? are you visiting SEM Rush? Are you clicking on the links into their site? Do you have any other extensions installed? I visited the SEM Rush site a few times when I installed the tool bar when it came out. I have not been back since today and that was only after the user name request popped up. I only went to make sure it was the same SEM Rush. I have other toolbars installed but nothing active at the moment. The most recent addon for firefox was the SEO toolbar and that was on January 15th. I know there have been some updates since then for various addons but nothing today and I was using firefox all day yesterday with no issues. I have been unable to recreate this by revisiting the sites. Hi, I was wondering if the toolbar pulls data for indexed pages or links from the engines or if that data comes from an API. In the past, I had issues with getting banned for a few hours at a time when multiple computers in our network were using the SEOQuake toolbar that gathered some similar data. This toolbar will be great for me if it doesn't create the same issues. Thanks in advance! We typically use API when possible. Also note that our information button data is only pulled in when you click on it, rather than being pulled in all the time on every page you happen to visit. Great toolbar, definitely better than SEOQuake, there's only one thing where SEOQuake is better: Pagerank is displayed as a number. Can you add an option to your toolbar to display Pagerank as a number instead of a green bar? I know there is some logic for the bar... for one, PR is not an extremely precise description of page value. But nevertheless, a number is just so much easier and faster to use. Why take digital quality and reduce it to analogue :-)? Another point... I love the ranking checker but had to download the individual extension to do scheduled checks. Maybe you should add that bit into the SEO toolbar? We will likely integrate the rank checker extension better in the near future. Wow an amazing firefox extension at last for the SEO minded. One little snag i have with mine but i'm pretty sure this is an isolated problem to me. A week or so ago the link checker section displays perfect for yahoo, Dmoz etc but BOTW now has a "?" on it for all sites i visit. I've tried resetting the toolbar and have also just recieved a new update for the toolbar but still displaying the same. Can someone please guide me in the right direction to solving this problem? we will take a look into this soon! Needless to say we all love the toolbar. spm=true seems like it's some filter redirection. Also note that this has happened even when I used this after a few days' gap. So can't be due to heavy checking only IMO. Finally I installed it, spent some time with it, and like it a lot. Thanks for another great tool. If you're taking suggestions, so far my only one is to have the IP Address copy to the clipboard when I click on it from the "Competition" menu (or on the toolbar as well for that matter). Yup...you have to be logged in as a free member to download it. Since you have a free member account and are now logged in the download link should work for you. Though you might need to hit the refresh button to re-load the page. I'm having the issue like a couple of others above. The extension is installed and enabled; I can see it when I look at tools/add-ons/extension. It's version 1.0.14. When I go to view/toolbars, it's not there. I also tried "restore default set" and that didn't help. Rebooted, restarted, nothing works. I have it working on my old machine, and am hooked on it. I'm moving to this new machine with Windows 7 and new Firefox, and can't get this to work. Any other ideas? Aaron, I intend to subscribe as soon as I'm able; I'm just getting started here. I did get it working so I thought I'd offer up what worked for me. -installed the toolbar, and other tools. -told Firefox to check for updates and installed the new Firefox. That is prettymuch all the troubleshooting we can do for free. If you are a paying subscriber we can help investigate further though. I cannot get the toolbar to display on my Mac - using the most current version. When i go to the view 'toolbars' area and try to check vs. uncheck toolbars to display, the seobook toolbar is not shown as an option. I can however see the icon in the bottom right statusbar. thanks. There are 2 different extensions...seo 4 firefox and the seo toolbar. Perhaps you only have 1 of 2 installed right now? I have trying all day to download and install the seo book tool bar for firefox but to no avail. already my browse in firefox which should make it faster. someone , should please help me out. Sorry but we can't provide 1:1 support to 1/3 million people for FREE without driving ourselves insane and killing our business. When is the next version/update coming out? Will the Google hyphen issue be resolved in that update? Any chance update release dates could be shown going forward? When I read your comment from early June that a new update is going to be released in 1-2 weeks, I spent 10 minutes trying to figure out if this update has been released or not. I have no idea. Thank you sir. Keep up the great work! ... it gets cut off after the search field. I have tried resetting defaults to no avail. I am running firefox 3.6.10 and windows 7. Any suggestions as to how I might be able to scroll to the right or add missing icons to another toolbar? Thanks for your time and attention. Much appreciated ! Hi, I really love the toolbar. However I was wondering if we could have the same saving option as in the Rank checker for the commpare site tools. It would be great to be able to save the URLs we enter and run a report daily like for Rank Checker. Also is there a tool that allows us to see from where visitors are coming to a website for our competitors? We won't be adding that feature to the compare sites function anytime soon. As far as analyzing competing sites goes, sure there are a bunch of competitive research tools. Hi. thanks for all the wonderful tools. I am not able to download & get to teh SEO QUAKE. Can someone pls help me. will you be releasing any tools for chrome? I use Chrome as a lean and fast browser without installing a bunch of extensions on it. I use multiple web browsers & am more efficient for doing so. I also think that installing SEO tools in a Google owned browser is a bad idea. Just upgraded my Mozilla Firefox browser and after restarting the application my SEOBook toolbar is no longer working I mean all I can see is the SEOBOOK logo but the buttons are gone, any updates on this Sir Aaron? I read and followed the directions on the page you linked to above. Rank Checker is showing up in the status bar now, but I'm still not seeing the SEO toolbar in FF 4. I'm really missing the X-Ray feature. Did I miss something there? Did you download the toolbar? rrobillard did you download the seobook toolbar or just rank checker? Thanks for replying! I had both. I just uninstalled and reinstalled from the link you left. Same result. All I get is the SEO Book logo. No toolbar. I'm pretty sure it was fine until I upgraded to FF 4. Rank Checker didn't seem to be working either, but I don't use that nearly as much as the toolbar. I already updated to Firefox 4 and I updated the toolbar too? it offers tips on how to fix that issue. I mistakenly chose autoscan and the Google results and image results appear with those annoying stats under each link and it is using up my CPU. How to stop autoscan? I couldn't find it in the SEOtoobar options. ...then I am too lazy to do it for you. Firefox has been nagging me for a while to install version 5. So I did and now cannot see my SEObook toolbar. I've tried downloading it twice and can't get it back. Same with SEO for Firefox. Like 'sidebyside' (above) I can't see the SEObook toolbar on Firefox 5 either. In addition I can't see SEO for Firefox of RankChecker. None of these are listed in the 'tools' drop down menu but they are in the add-ons list and appear to be active. I have the add-on bar active but the SEObook toolbar, RankChecker and SEO for Firefox are still nowhere to be seen. I've tried customizing the toolbar (restoring default and selecting icons only) as is suggested. I also installed status-4-evar but that hasn't made any difference. Am I doing something wrong? Would be great if you could help. My apologies. I've fixed my problem with Firefox and SEObook. Just in case anyone else had problems (like you sidebyside) I followed the instructions here http://support.mozilla.com/en-US/kb/Basic%20Troubleshooting. It was fixed after step 4 (starting in safe mode) and while in safe mode deleting/removing unwanted or non-compatible add-ons. Once I restarted in normal mode I turned on the add-on bar and everything came back. The downlaod link just keeps redirecting me to the sign up page. I already signed up and logged on but cannot download. It just keeps redirecting me!